The 25.7 metre motor yacht Aurora, listed for sale by Marc Haendle at Ocean Independence, has been sold with Robin Wake at Polaris Yachting introducing the buyer. Built in steel and aluminium by Dutch yard Moonen to a design by Rene van der Velden, she was delivered in 2004 fully equipped for extended sea voyages. An interior in high gloss cherry wood accommodates up to eight guests in four cabins. These consist of a master suite, VIP suite and a twin along with a single cabin with a rowing machine which could be converted into a further twin, and all cabins have en suite bathroom facilities. The exterior offers several areas for outdoor entertainment, including the aft deck with built in upholstered seating, and an expansive flybridge with a bar, gourmet grill and fridge. An extensive €500,000.00 refit was carried out by Moonen from 2011 to 2012, including a complete repaint of the hull and superstructure, and maintenance work on the engines and generators while in 2013 further warranty work was carried out by Moonen including a respray of Aurora’s blue hull. Twin 480hp Caterpillar engines give her a cruising speed of 11 knots and a range of 2,900 nautical miles at 9 knots. 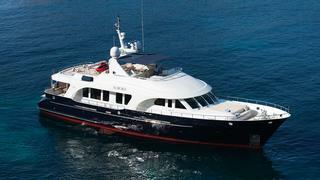 Lying in Palma de Mallorca, Spain, Aurora was asking €1.8 million.